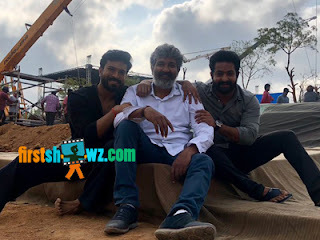 The much anticipated multi-starrer RRR starring Young Tiger NTR and Mega Power Star Ram Charan in Rajamouli direction started rolling cameras from today, and it has commenced with an intense action sequence featuring both lead actors. The schedule is planned to be filmed at a giant set erected in Hyderabad outskirts, and the first shot of the shoot showing Rajamouli went viral. The video has Rajamouli asking Charan and Tarak if they were ready, and Rajamouli directing the first shot. RRR is being bankrolled with a huge budget of 500 crores, and NTR and Ram Charan have gone through the makeover for their looks in the film. MM Keeravani is the music composer. We hear RRR pre-release business is going to be close to 500 crores which will be highest ever for a Telugu film.